Flying a state-of-the-art unmanned aerial vehicle (UAV) high above rugged rural terrain to collect survey data is a part of Selkirk College alumnus Alexandre Landry’s profession that will never grow old. A geospatial analyst for Nelson’s Harrier Aerial Surveys, Landry is part of a team that provides high-precision surveying, geographic information system (GIS) data and remote sensing services to a diverse range of clients across the province. The majority of the data collected and analyzed by Landry is gathered using UAVs, more commonly known as drones. Harrier Aerial Surveys was co-founded by veteran professional survey engineer Robert Simmerling and operations manager Peter Lecouffe, also a Selkirk College alumnus. The company specializes in aerial imagery, terrain modeling, mapping/GIS and inspections. Customers come to Harrier seeking accurate data for projects that require minute detail. They work with companies involved in forestry, mining and architectural firms where they can survey complex terrain and provide modelling or aerial imagery for project planning and design. Originally from Montreal, Landry began his post-secondary journey at Concordia University where he was studying in the Geography & Urban Planning Department. During his first two years of study, he was introduced to the field of GIS and his imagination was captured. Wanting to focus more on GIS, Landry did a quick internet search and discovered what he was looking for with Selkirk College’s School of Environment & Geomatics. With a fondness for British Columbia and the outdoor recreation the West Kootenay provides, Landry packed his bags and headed west. He transferred his credits to the Advanced Diploma in GIS Program based out of the Castlegar Campus and started to focus on his passion. After graduating from the one-year diploma program, Landry took advantage of opportunities available through the Selkirk College Co-op Education & Employment Services and landed a position with the Ministry of Forests, Lands & Natural Resources out of Cranbrook. He returned to Selkirk College to complete his education, spending one more year of study to earn a Bachelor’s Degree in GIS. Landry says the two years he spent at Selkirk College was a immersive experience that would have been unlikely at a larger post-secondary. 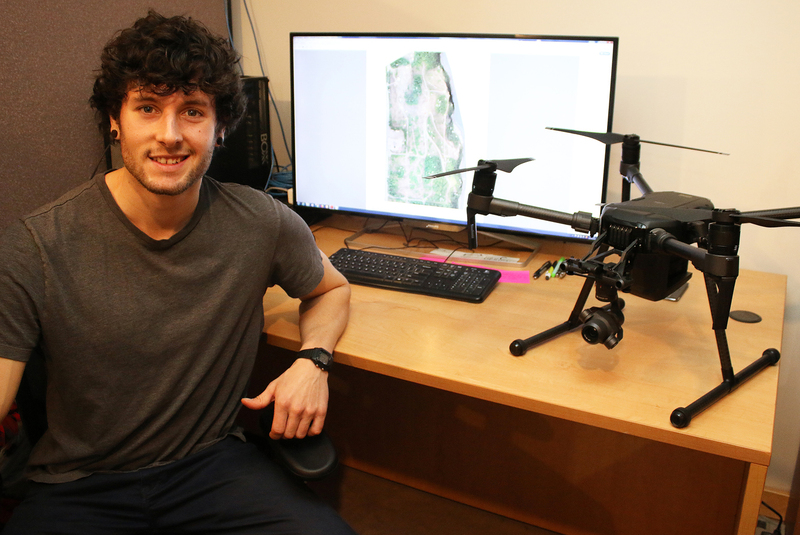 After graduating in 2017, Landry spent time working on smaller projects at the Selkirk College’s Applied Research & Innovation Centre (ARIC) in Castlegar before catching on with Harrier Aerial Surveys. Now working for a small company on the cutting edge of new technology, Landry is able to put his education to good use. In a career area with a bright future, Selkirk College’s unique focus on GIS pathways sets graduates up for success in a broad range of industries and fields. Learn more about the GIS opportunities in the Selkirk College School of Environment & Geomatics at: selkirk.ca/school/environment-geomatics.